Who the Heck Says YOU Are a Writer? I love hockey. Fanatic. Maniacal fanatic. I played as a kid. Skokie Park District team and my high school club team, the Niles West Indians. … maybe that’s a bit harsh. But I wasn’t very good. Was I a hockey player? Sure I was! I wasn’t a National Hockey League superstar. But I was a hockey player. It’s okay to call myself a hockey player. It’s not okay to say I was a star in the NHL. Jeff Goins is a writer, and although I have never met him in person, someone I consider a friend. He wrote a brief post on why you aren’t really a writer until you decide to call yourself a writer. Do you write? No? Well, then you’re not a writer. But if you write, then you’re a writer. So who are you trying to convince? Somebody else? Listen and watch what happens when you confidently tell a person that you are (or introduce yourself as) a writer. (2) You start to believe it, too. Over time, you replace your internal dialogue. A person who doesn’t know you immediately identifies you a certain way. You, however, know you. If you haven’t already identified yourself as a writer, how can you convince yourself? Tell yourself you are a writer. To paraphrase Pope Benedict XVI, what sets apart the great cultures is their relationship to the Divinity. Are we becoming a culture moving toward that type of relationship? Or are we becoming a culture distancing ourselves from God? Can we ascertain how we evaluate that judgment? There’s a God-shaped hole in our lives. – Peter Herbeck, Renewal Ministries, Fire on the Earth, EWTN, Friday, July 17, 2015. How do you try to fill yours? Wouldn’t you like to slug him? Maybe you didn’t have a little brother. Maybe you had a little sister like this. Or maybe it wasn’t a sibling, but a friend. Or an acquaintance. Maybe it was a co-worker who was this annoying. Whoever, I’ll bet you’ve had personal experience with somebody in your life who annoyed you to the point of… oh, maybe wanting to strangle them. Or just… witness some minor mishap befall them. Just to see them squirm a little. That’s okay. That’s human nature. It’s not right. It’s a fault. It’s a sin we need to confess. But we’re human. We have thoughts like these. Have you ever read or listened to the Genesis account of Joseph — yeah, the Technicolor Dreamcoat guy; that Joseph — and thought of him like that? We’re reading the Genesis account of Joseph and his brothers this week at Daily Mass. Father Mitch Pacwa described Joseph like this yesterday during his homily on EWTN. I had never heard that description before. So what do we do with a person like Joseph? That annoying person in your life? Jesus spells it out for us in the Gospels. But there’s a more recent admonition from him. When He appeared to Sister Maria Faustina, Jesus told her — told us — that He demands from us deeds of mercy toward our neighbors. Next time we have these very human thoughts, maybe we think twice. Make no mistake. We will have those thoughts. We are human. What matters is what we do with them. Thanks for taking some of your precious time today to read my thoughts. 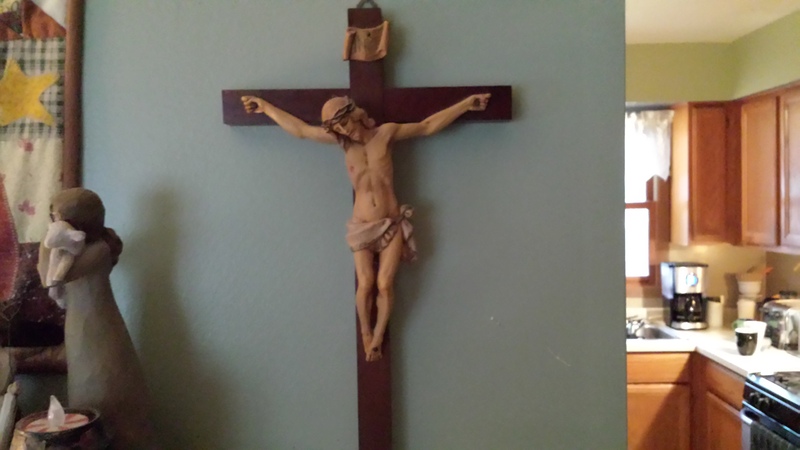 My intention, beginning Friday, April 17, 2015, is to post a brief, daily meditation based on the readings from the day’s Catholic liturgy. I would appreciate your help and encouragement. This is something I’ve been called to do for some time. I’m finally embracing it. Father, forgive me for procrastinating. And for not posting a meditation daily. What a day! Martha, the youngest of our five children, told us two weeks ago (or so) that she wanted to take us out to dinner for our (30th) anniversary, which is tomorrow. “What are you guys doing on Sunday?” She wanted to know if we had plans the day before our anniversary. Maybe just to get away for a day. Maybe go for a long drive, which we like to do; drive to… wherever… then stop and do whatever. Depends where we end up. Were we free? Why did she want to know? Our traditional Independence Day celebration is at my mom and dad’s house in Morton Grove. We typically arrive before the parade and head to Harrer Park just before dusk for the best fireworks in the area. So it was going to be a late night. We usually don’t get home until right around midnight. Kathy and I told her that we didn’t have any plans. Since the Fourth was on a Saturday this year and Friday was the legal holiday, Kathy has to work Monday, our actual anniversary. Despite her attempt to get the day off months ago. We were just planning to relax and recoup after a hectic Saturday, so no… we had no plans. Last week, she gave us the “bad news” that after our late night of fireworks and way too much food at Mom and Dad’s house, we would need to leave really early on Sunday. She made a reservation and the only time she could get was early. And she wasn’t kidding that we needed to leave early. 9:30. That’s early for a dinner! Where the heck were we going? St. Louis?? But it was her treat and she wanted to surprise us. Sure enough, we didn’t get home last night until 12:02. It was going to be a short night. We figured we could go to church at St. Therese. They have an 8:30 Mass. And we could leave right from there. Despite the cats’ best efforts, they couldn’t wake me up until 7:36. We managed to get there just after Mass began, but we were going to have to stop at home before leaving for the restaurant. Martha asked if she could drive. It was her surprise, so of course we agreed. We drove south. I-294 to I-88 and off the highway near Oak Brook. I guessed wrong. As we approached our destination, I thought we were going to The Melting Pot in Downers Grove, one of Martha’s favorite restaurants. We ended up at Drury Lane. We were going to see a show! As we walked inside, Martha told us we were having brunch. When we walked into the dining area, her secret was exposed. Aidan and Andrew! I saw two of our grandsons walking into the buffet area. At two tables in one of the large dining rooms sat our other four kids, spouses, their kids, Martha’s boyfriend, Chris, and Mom and Dad. The tears began flowing immediately. If you live or ever visit the Chicago area, you must visit Drury Lane for their Sunday brunch. There were more food choices than you can imagine. Breakfast. Lunch. Dinner. Dessert. Ice cream bar. Fruit bar. Salad bar. At least half a football field long. I’m not doing it justice. But that’s not the point of my story. The masterful job done by Martha to orchestrate everything. We thanked each of the kids profusely and every one of them told us that it was all Martha’s doing. We stayed, ate, drank, talked, laughed (after Kathy and I finished crying), drank and ate and talked some more. And said we were full. We stayed for more than three hours. We “closed” the joint. Well… at least the buffet. Stephen had to leave early because he had to work. He does some work at the fitness center in Waukegan on Sundays. Duty called. He left around noon. Before we left, we asked one of the waiters to snap a photo, sans Stephen. Thanks, Mom and Dad. Thanks, Chris. Thanks, Stephen. Thanks, Doug and Amy. Thanks, Andy and Cheryl, Andrew, Addison, Catelyn, and Charlie. Thanks, Sarah and Dan, Alexis, Aidan, and Ethan. We love all of you so much we can’t stand it. Thanks for a weekend full of fun, full of love, and capped with one massive surprise. You are currently browsing the thephilosophyofdave blog archives for July, 2015.